The Myth of the NFL's 1-2 Punch — . Ready for a data-driven Friday? I've finally gotten to that question of the 1-2 Punch theory in NFL scoring. To recap, this project began when I decided to do some analysis of comebacks in the NFL. I wanted to know how much game time was needed for a reasonable possibility of a team coming back from a given score deficit. I bought a fantastic dataset from ArmchairAnalysis.com, loaded it into SQL Azure, and analysis ensued. My first significant discovery was that historically (from 2000 through the 2016 season) the details of a comeback were largely moot -- a team that trails at any time has less than stellar odds of winning. More importantly, the team that scores first has a 65% chance of winning the game, 70% if that first score is a touchdown. So, let's start with an easy-to-answer, preliminary question: how often is the game won by the team that receives the second half kickoff? Answer: 51% of the time. That's right, 51%. ** There's clearly no inherent advantage to simply receiving the second half kickoff. Figure 1: A successful 1-2 Punch rarely occurs. First, using the pre-assembled [Drives] data, I set a flag**** for each game showing whether a 1-2 opportunity existed. I.e., the team on offense for the final drive of the first half also received the second half's opening kick. Turns out that such an opportunity occurred in 49% of games. Sounds promising, and not unexpected. Next, I created a flag to show whether the 1-2 Punch was successful. The criteria here is easy -- the offense has to score on each of those two drives. Regardless of the type of score, as long as the offense scores points on the closing/opening drives, the 1-2 Punch was successful. Here's the good news: when a successful 1-2 Punch occurs, the team has a 67% chance of winning the game. Here's the bad news: it hardly ever happens. Check out Figure 1, the nice, colorful graphic. In this sixteen year dataset, out of 2,206 1-2 Punch opportunities, the team with the opportunity was successful only 159 times. That's 7%. Of those 159 games, the team in question won 107 times. No matter how you slice it, the 1-2 Punch has very little impact on the outcome of a game. Figure 2: Who gets the most 1-2 chances? Still, in the rare instance that a team does pull off the 1-2 Punch, their chance of winning is certainly higher. So, are any NFL teams significantly better at generating a 1-2 Punch opportunity? Yes, a few teams are. Figure 2 shows us that Tampa Bay, Jacksonville, Miami, and Baltimore have each generated 1-2 opportunities in 57% to 59% of their games, somewhat more frequently than the league's 49% average. Figure 3: Who converts their 1-2 opportunities? But alas...none of these teams are particularly good at converting the 1-2 Punch. Figure 3 shows the only teams who are successful at 10% or more of their 1-2 Punch opportunities. The Colts blow away the league's 7% success average, converting on 21% of their opportunities. It's a shame that they have the opportunity so relatively rarely, in 42% of their games. The team that receives the second half kickoff wins 51% of the time. A team that successfully scores on each drive of a 1-2 Punch opportunity wins 67%. 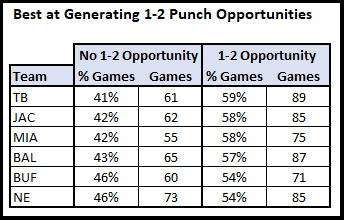 However, teams only successfully convert 7% of all 1-2 Punch opportunities. Conclusion: a successful 1-2 Punch bid does increase the likelihood of a team winning, but successful conversion is so rare that the 1-2 Punch can't be considered a practical part of a team's strategy. Is that conclusion useful? Sure -- it allows your business stakeholder (in this case, the coaching staff) decide NOT to waste time on a non-impactful strategy. That's valuable information. But in business terms, the job isn't finished. The desired business outcome here is to win more games. We've determined that scoring first (and doing it by way of touchdown) is a key part of the strategy. We've determined that angling for the 1-2 Punch is not. Hence, unless further analysis is more enlightening, we should be able to make one solid business decision: upon winning the coin toss, elect to receive first. There's certainly more analysis to be done, and this is probably an opportune time to discuss business analysis approach versus stakeholder management. But that'll be next week, as it's time for hockey in this household. Go Stars! * If I were a better writer or knew more about football, I'd come up with a better name here. ** For the non-mathematically include, that's roughly half. *** That may have sounded a bit more exciting in my head.